GMC TRUCKS Sticker - $10.00 : Bob Hoyts Classic Inspection Stickers, Add a Final Touch to your Restoration! 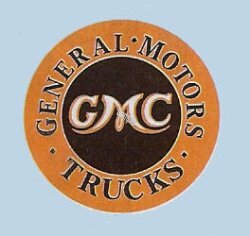 This undated classic General Motors TRUCKS logo dates back to the 1960's or earlier. It has our patented "Peel and Stick" process that allows buyer to place it INSIDE your car window to protect it from the weather. It is approximately three inckes square.